A unique luxury hotel located in the heart of Geneva’s old town, the Hotel-Restaurant ‘Les Armures’ is a magnificent 17 th century residence situated 5 minutes from the lake, local shops and the business district. Its restaurant with a terrace serves typical Swiss and French specialities in a homely setting. 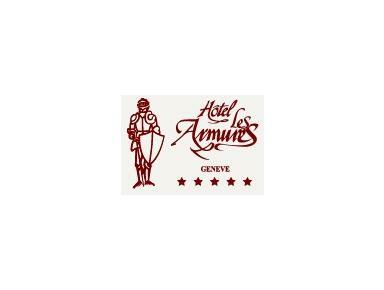 The Les Armures Hotel boasts a refinement and warmth that attracts and retains the affection of a clientele seeking style, comfort and a calm ambiance. Excellent furnishings and a warmth of character that unites classic and contemporary styles come together to create a unique setting and a jealously kept secret.